Spending time with family is important! Sometimes it is easier said than done. 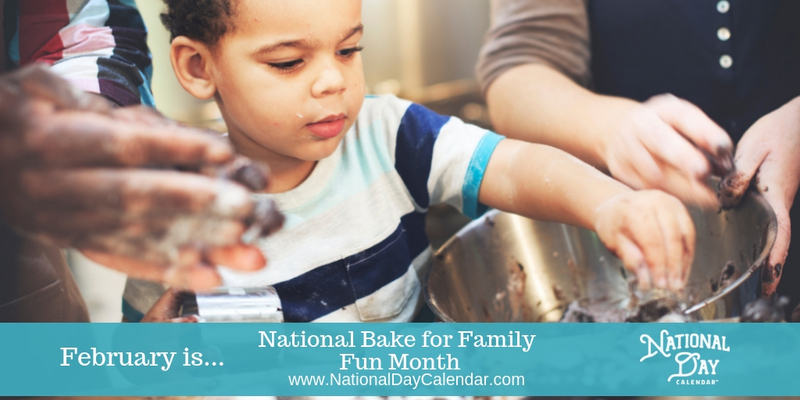 The National Bake for Family Fun Month was “founded to encourage families to spend time together by baking together”. As a way to help celebrate our families (and yours), we thought we would share a few of our staff’s favorite “baking” recipes as well as what we will be doing to celebrate Bake for Family Fun Month in hopes that it may inspire you to share a little extra time with your family. As some of you may know, I have dedicated my life to working with children and families- my degree, my jobs. It’s not just my education or a job, it is my calling, my passion. When I had children of my own, I applied what I knew from school and my jobs to parenting and then vice versa. 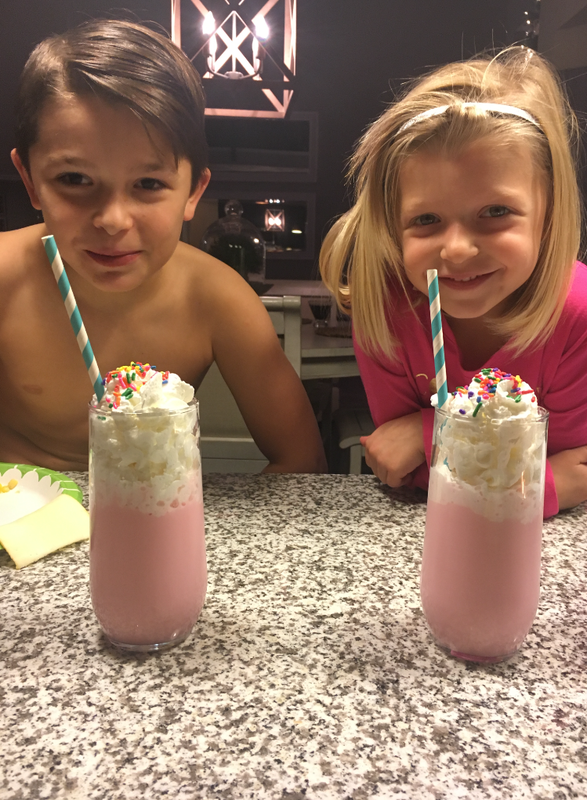 If I was in the kitchen, my kids were in the kitchen with me. It wasn’t always neat and tidy. Ok, let’s be real. It was RARELY neat and tidy. Tasks took twice as long (or longer), and it was MESSY. 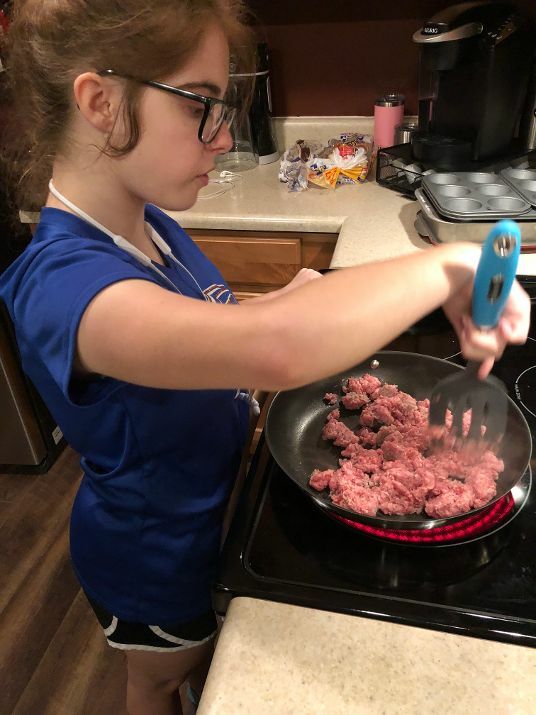 It was math, science, language, general life skills, but most of all, it was me, in the kitchen with my kids, talking to them, listening to their stories, spending time with them, and learning more from them sometimes than I think they were learning from me. It’s an opportunity for both of you. I have three teenagers now. I never have all of them in the kitchen with me- at least not helping me prepare the food. (Consuming food, now THAT is a different story.) And, I can’t say messes are a thing of the past. What I can say however, when those moments arrive, it’s nothing short of magical. There are conversations, laughter, sometimes even some tears. I feel heard. They feel heard. For those of you who don’t have teenagers, this may not mean much to you. For those of you reading this who have teenagers, you know that truly IS magical. Here’s hoping you find some magic in the kitchen with you and yours! 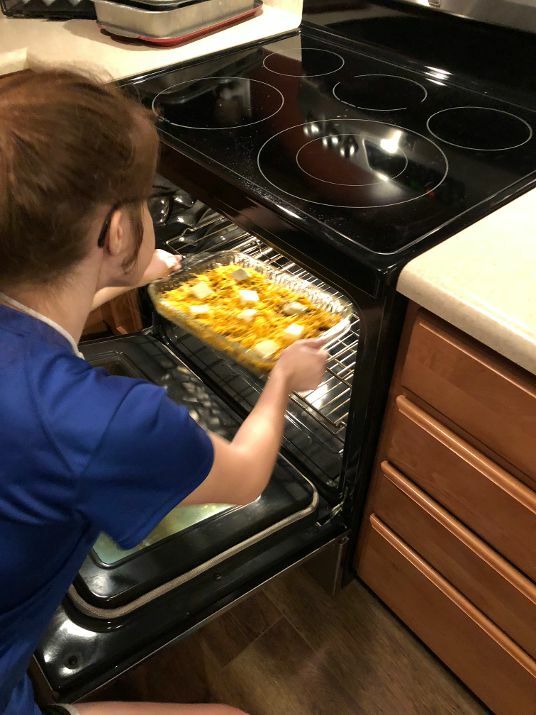 Inspiration #1 – Jennifer K.
When I asked Jennifer about contributing for National Bake for Family Fun Month, she looked at me like I was crazy (her brow furrowed and I knew it was time for her Botox appointment), and then her face lit up. 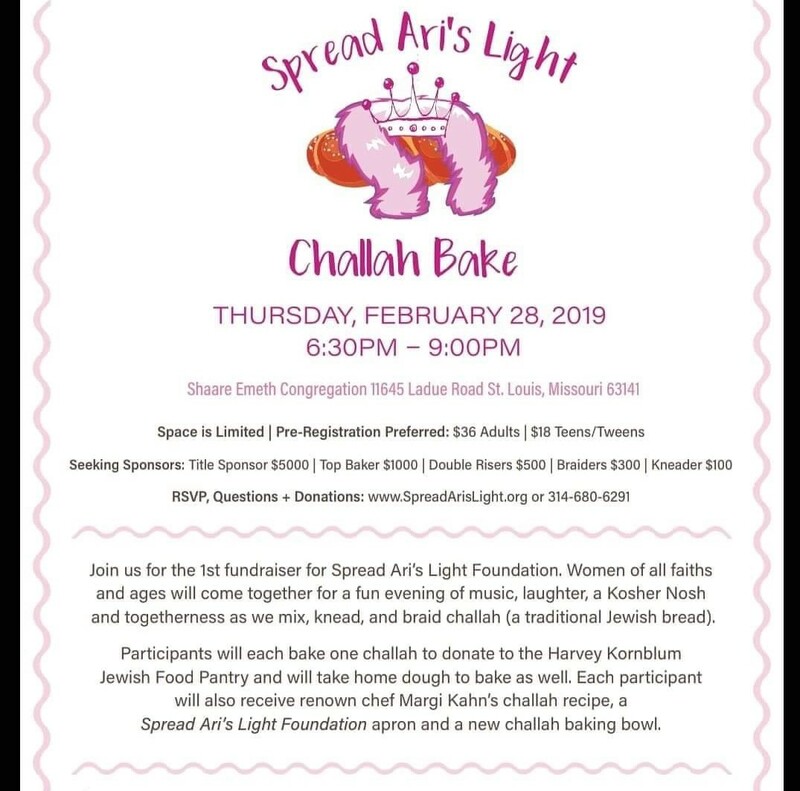 “I am baking with my mom next month!” she exclaimed with a huge smile on her face. Mix well and pour into a greased 9×13 pan. Bake at 325 degrees for 30 minutes. Are you interested in freezing the brownies like Jennifer and her mother do? It’s simple! Bake. Cut. Wrap and freeze. 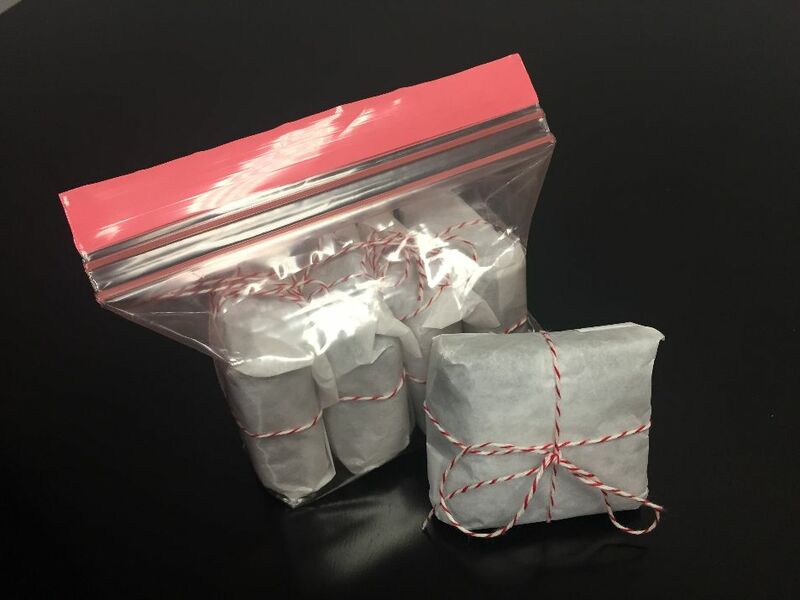 You can wrap in aluminum foil and then place in a zip lock freezer bag, or wrap individually. It’s really that simple. Take them out when you’re ready to enjoy. Spray 9×13 baking dish with Pam. Break bread into pieces and place in bottom of dish. Brown sausage; drain and put on top of bread. Beat eggs; add spices and milk, and pour over top of bread and sausage. Sprinkle cheese and margarine over top. Store in refrigerator overnight. Bake at 325 degrees for 1 hour covered with foil. Winding down after a day of spending time together? Everyone’s been doing their own thing? It’s been a rough day for all? Try Melissa’s Unicorn Milk. Mix Coconut Milk and Strawberry Syrup. Viola! Conversation and giggles are sure to follow. Inspiration #3 – Jennifer W.
Life can get crazy. Schedules – crazy. Time – constrained. Jennifer uses her instant pot to help ease the transition from busy job to jumping into the busy nights. 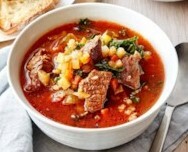 While this isn’t a recipe that brings her family together in the kitchen, it is a hardy meal everyone loves that brings them running to the table to enjoy as a family before they part ways. If you have an instant pot, have the family help prep the ingredients and then let the instant pot do its thing while you hang out with the family. Sit down and relish a moment spent around the table. Set Instant Pot to sauté mode. Add 2 tablespoons olive oil and steak. Sauté till brown on the outside. Remove from pan. Keep in sauté mode and add 2 more tablespoons olive oil. Add celery, carrot, garlic and onion. Sauté till softened, scraping the browned bits into the mixture. Turn off sauté mode. Add back the steak and all it’s drippings as well as the basil, oregano, tomato sauce, broth, pasta, spinach or kale and green beans or zucchini. Close the lid and set to manual for 6 minutes. It will take about 8 minutes to reach high pressure, then it will cook for 6 minutes. When timer goes off, let sit 1-2 minutes. Then set to quick pressure release to vent steam. Remove lid and add beans. Add salt and pepper to taste. Serve with Parmesan sprinkled on top. *Helpful Hint: Give each of your children their own plastic bag. 2. Mix white sugar and cinnamon in a plastic bag. Cut biscuits into quarters. Shake 6 to 8 biscuit pieces in the sugar cinnamon mix. Arrange pieces in the bottom of the prepared pan. Continue until all biscuits are coated and placed in pan. If using nuts and raisins, arrange them in and among the biscuit pieces as you go along. 4. Bake at 350 degrees F (175 degrees C) for 35 minutes. Let bread cool in pan for 10 minutes, then turn out onto a plate. Do not cut! The bread just pulls apart. In a double boiler, add the chocolate chips, coconut oil and peppermint essential oil. 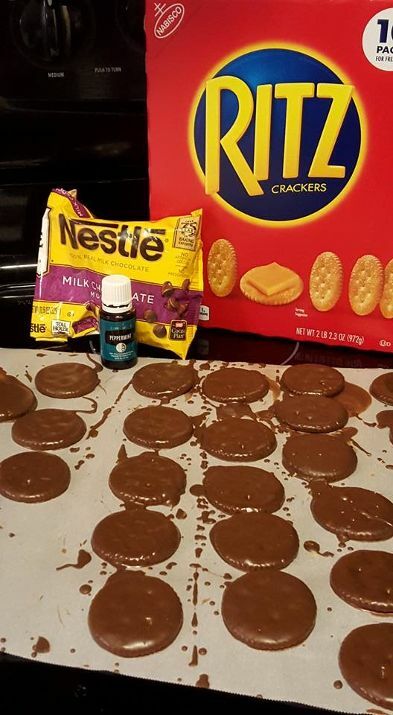 When melted, dip the cracker in the chocolate to coat and put on parchment paper to dry. That’s it! It’s so easy and delicious. You can add extra drops of peppermint if you like it really minty. Cooking with oils gives dishes such great flavor. (I use my lime, peppermint, lemon, pepper, and cinnamon oils all the time.) Be careful that the oils you use are safe for ingesting (some oils are not meant to be ingested and many oils available have additional fillers and such). If you are not sure and are looking for safe oils to use in cooking/ baking or just in general, you can check these out. Regardless of the recipe you use, gather your family, go to the kitchen, and find some magic! Leave your comments/questions below and follow us on Twitter to continue learning about beauty and health issues. How Radio Frequency MicroNeedling Results Blow Away Traditional Microneedling... What is a Fibroblast treatment? What is a Plasma Pen?